Where are Fuel Margins Headed? We have recently completed two years of record strong fuel margins for a number of reasons (see attached chart courtesy of OPIS). What caused this trend and might it continue? Several cost push factors have been at work pulling up margins. One important factor has been rapidly rising land and construction costs, especially for prime locations, which even become reflected in selling multiples and cap rates in general. Labor costs are now accelerating faster than productivity gains. Obamacare, insurance, site development, and regulatory costs in general keep going up. And then there are capital outlays for PCI compliance. But wait, the last two years have seen crude oil prices decrease from over $100 per barrel to $30 per barrel, similar to 2008 that also brought great industry margins. But at $30 per barrel and everyone fearful that $20 is next, some stabilization is likely, particularly because it seems the U.S. dollar is taking a breather here, as the world realizes the overall U.S. economy is slowing as well. And, unlike interest rates, oil prices can't go below zero, I think. 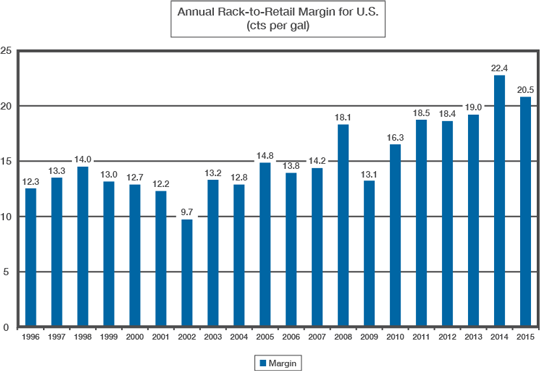 In an economic slowdown, margins in general often fall as competition gets more entrenched. Weak competitors cut prices to stay liquid, while strong competitors try for market share gains. Some areas of the country are seeing large new store expenditures based on a higher margin foodservice model, which require significant traffic on the forecourt. Some of these operators have historically had negative breakeven fuel margins. Also, Walmart's reemphasis on fuel could become quite a localized competitive issue. Then, how will the other supermarket companies react? Maybe a key factor affecting retailers' fuel margins will be how low oil prices may cause integrated oil companies to attempt to recover greater refining profits to offset their huge reductions in crude oil production profits. 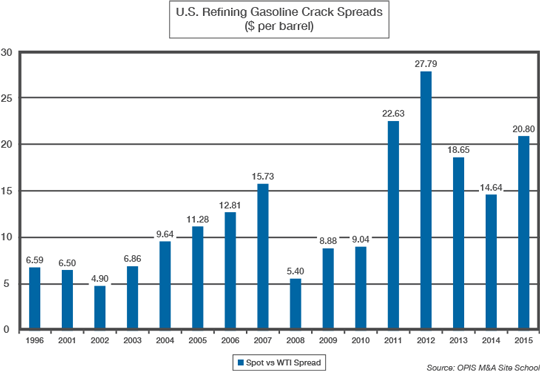 Note the historic refiner gasoline gross margin trend on the next chart. Even though refining is a cyclical business and refiners have huge crude oil inventories to convert into products, mergers have created many fewer competitors than used to be, especially in the U.S. And gasoline demand should increase by at least 2% this year. Retail competition has also consolidated somewhat, but nowhere near as much as refining. If refiners successfully draw inventories during the upcoming refinery turnaround maintenance period, any summer unplanned shutdowns could make huge regional impacts. As always, because of product specification issues, California is most vulnerable, such as occurred in 2015. How do you feel the above plusses and minuses will average out for retailers? My own guess is national retail gasoline margins will average out about 18c/gallon in 2016, or about 3c lower than the prior two-year average. As always, regional differences will be significant. These margins will still be excellent by historical standards, but painful for some that are facing large cost increases, or do not have the strength of a solid foodservice program.